I wanted to write this quick summary of how my Crypt of Darne game project went, now that I've collected data long enough. Without further ado, let's begin! You enter the Crypt of Darne and you're looking for a specific gem. Will you survive?" Crypt of Darne is a free roguelike-ish dungeon delving game, where you make a character out of few race-class combinations and explore a crypt, trying to find a specific gem. You'll know it when you see it, but it is hidden deeply in the crypt. Good luck! Crypt of Darne was supposed to become a proper roguelike, however I remembered to keep the scope small and decided to just make a simple dungeon crawler style game. It has roguelike-ish elements, such as permadeath. The game is completely controlled with keyboard, but you can see the name of any tile with hovering your mouse over it. I created the game for Games Made Quick 2017 gamejam, however I continued working on it even after the jam. It took me two months total to make it to version 1.0.0. Man, I learned A LOT! I learned how to work with Python and LibtcodPy, how to publish a game on itch.io, how to do pixel art, how ASCII tilesets work... So many things that.. I kind of forgot some of it. Sorry, it's been so long since I worked on it last time. 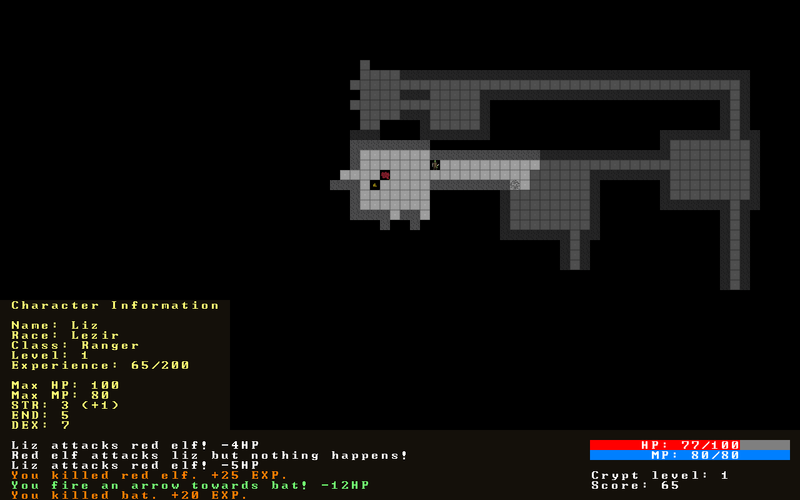 I have to give an honorary mention to the tutorial I used to make this game: Roguebasin Roguelike Tutorial. Making the game definitely helped me grow as gamedev! Sometimes I was having so much fun making the game I barely wanted to stop. Hours flew by as I typed out more and more code, drew tiles or just dabbled on the game's backstory. There's not many interesting things behind the scenes I could really share. It's very What You See Is What You Get -style game. The best part however was that someone donated me 3€ for this game!! And my friend also gave me 1€! Sure it's not much, barely anything, but this game was the first game that has gotten me anykind of revenue. I will always cherish it because of that and it helped me to figure out that maybe making games truly is my thing! Over the course of three months, the game gained 981 views total and 93 downloads total. I got most views through Reddit, where I shared a link to my game on a finnish subreddit. So, marketing is important and social media is truly the best way to do it. I expect the game to still get a few odd views here and there and maybe an occasional download, however I don't expect it to explode in popularity. I also want to mention that I had much fun writing a backstory and a book about the playable races. I wrote them "in character" as in I was writing them as someone from the same world where the game is located in. You get these pdf's when you download the game. So, what was bad then? Sometimes I ended up with a bug or slump I couldn't really get over until after a break for few days. It was super frustrating and gave me headaches. I was also trying to add too many things in the game at first and was stumped by my own lack of skills. Python is simple enough but LibtcodPy isn't very easy, atleast not for me, so having to work with that definitely took some time for me. Drawing also isn't my strongest suit, so I had to fight with my programmer-art few times to get anything look right. I learned, but it was also really frustrating at times. Balancing the game, so that no character would be too overpowered, was also quite difficult, but it also was very rewarding when I got it all right. Lots of spreadsheets and math! All in all, I'd say this project was very good learning experience to me and I mostly enjoyed making it. I'm glad I did it all and I hope that atleast one person liked it. :) As long as there's one person that likes my game, I'm happy and I feel like I've made a contribution to society, as clichey as that sounds. Feel free to give me any kinds of comments on the game, the good or bad (please be gentle), on either here or on itch.io. Also if you have some questions about working on the game, ask ahead and I'll try to answer as best as I can!